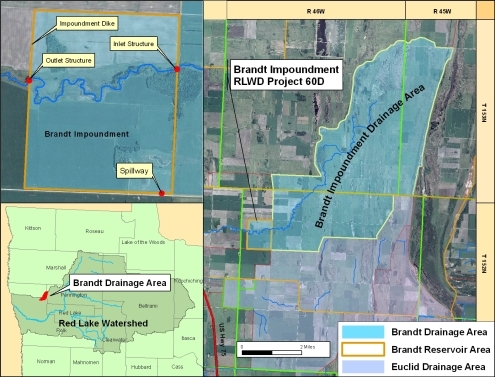 The Brandt impoundment project (RLWD Project 60D) is located in Section 7 of Belgium Township in Polk County. It is approximately 14 miles north of Crookston, about a half mile east of U.S. Highway 75. The Brandt Project is designed reduce downstream agricultural and urban flood damages by retaining up to 3,912 acre-feet of excess runoff from the upstream drainage area. This impoundment facility will reduce peak discharges on the downstream "Brandt Channel" and legal County Ditch #2 system. The embankment and reservoir is constructed of approximately 3.5 miles of earthen clay embankment (492,579 cubic yards and up to 19 feet in height), a grass lined emergency spillway, 2 lines of 6 x 8 concrete box culverts, and a gated concrete outlet structure. Operable components are the gated structure which releases water from the impoundment into an outlet channel. This water then flows west-northwest through the "Brandt Channel" legal County Ditch #2 system and eventually to the Red River of the North. The project became operational in the spring of 2008. The Red Lake Watershed District and HDR Engineering of Thief River Falls jointly performed construction surveying and inspection duties. The project is funded by the State of Minnesota, Red River Watershed Management Board, and the Red Lake Watershed District.